AICC, through its membership in the Council of Manufacturing Associations, is pleased to present the “Monday Economic Report” from the NATIONAL ASSOCIATION OF MANUFACTURERS (NAM). There were continuing signs of strength in the labor market last week, with job openings for nonfarm payroll businesses rising to a new all-time high, up to 6,550,000 in March. 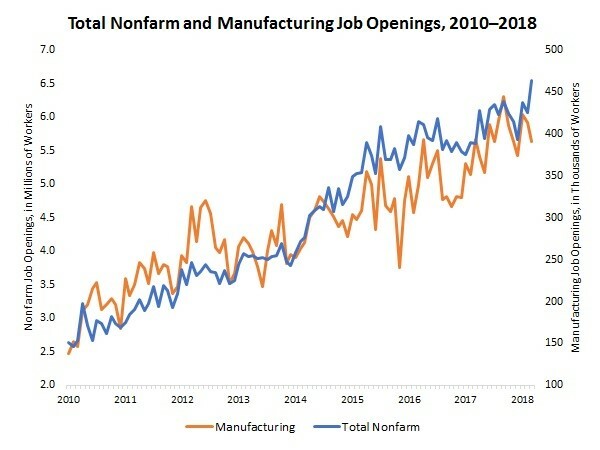 Hiring has been the top challenge for the past two quarters in the NAM’s Manufacturers’ Outlook Survey and was the “single most important problem” for the fourth consecutive month in the National Federation of Independent Business survey. More importantly, manufacturing firms have hired nearly 27,000 workers per month over the past seven months—a sign of just how robust job growth has been of late in the sector. With that said, in the most recent Job Openings and Labor Turnover Survey data, manufacturing job openings edged lower for the second straight month, down to 391,000 in March. Even with some softer data recently, the pace of manufacturing job openings has trended higher in general. For comparison purposes, monthly job openings in the sector have averaged 409,667 year-to-date in 2018, up from monthly averages of 341,250 and 389,667 for all of 2016 and 2017, respectively. Moving forward, renewed strength for job openings would be anticipated in the coming months. Meanwhile, the University of Michigan and Thomson Reuters reported that the Index of Consumer Sentiment remained at 98.8 in May, the same level as in April but off from March’s 14-year high (101.4). Americans felt more upbeat in their outlook for the coming months in the latest survey, but that was counterbalanced by some easing in assessments about the current economic environment. Americans are aware of the current tightness in the labor market, and those completing the survey increased their expectations for price increases, with roughly 80 percent of consumers expecting more Federal Reserve action as a result. While consumer spending continues to remain a bright spot overall, there were also some signs of softening. The Federal Reserve Board reported that U.S. consumer credit outstanding rose 3.6 percent at the annual rate in March, decelerating for the second straight month and increasing at the slowest pace since September. Revolving credit, which includes credit cards and other credit lines, was the main culprit for the easing in the headline number. It fell 3.0 percent at the annual rate in March, extending the 0.6 percent decline in February. This suggests that Americans felt somewhat less willing to take on credit card debt in March, with that figure at the lowest level since November. To be fair, even with some recent softening in the data, revolving credit has risen 4.8 percent over the past 12 months. Returning to prices, there was some mixed inflationary news last week. Manufacturers have continued to cite accelerating input costs as a concern, and the Federal Reserve noted increasing pricing pressures in its most recent statement. Encouragingly, producer prices for final demand goods were unchanged in April, and there was some deceleration in the year-over-year pace. Producer prices for final demand goods and services have increased 2.7 percent since April 2017, down from the 3.0 percent rate in March, which was the fastest year-over-year pace since November. Even with some easing, raw material costs have accelerated across the past few months, drifting higher since being 1.9 percent year-over-year in June 2017. Similarly, core producer prices—which exclude food, energy and trade services—have increased 2.6 percent over the past 12 months, down from 3.0 percent in March. For comparison purposes, core producer prices rose 2.0 percent year-over-year at this point last year. For consumers, prices rebounded 0.2 percent in April after edging down 0.1 percent in March, boosted by higher food and energy costs. Yet, excluding food and energy, core consumer inflation inched up 0.1 percent in April, the slowest pace since November. The bottom line is that the consumer price index has risen 2.5 percent over the past 12 months, the same pace as in the prior release, which was the fastest year-over-year rate since March 2017. Despite some recent acceleration in consumer costs on a year-over-year basis, overall pricing pressures remain mostly modest. This would indicate that inflation remains under control for now, even if consumer prices have picked up in recent months, and is just slightly above the Federal Reserve’s 2 percent target. This week, there will be several indicators showing the health of the U.S. manufacturing sector. The Federal Reserve will release new industrial production figures for April on Wednesday. In the March data, manufacturing production rose 3 percent over the past 12 months, the best rate since June 2012. Likewise, regional manufacturing surveys have continued to reflect optimism about activity and the outlook for the next six months, and there will be new sentiment reports from the New York and Philadelphia Federal Reserve Banks. There will also be important updates on housing starts and permits, leading indicators, retail sales and state employment.